This reprint by the Gettysburg Discussion Group is done with the permission of the author. The book is available for purchase at the Gettysburg National Battlefield Bookstore. Near the main statue is a monolith containing the names of the North Carolina units that were a part of the Army of Northern Virginia. It was built under the auspices of the United daughters of the Confederacy and was dedicated the same day as the main statue. Tennessee was the last of the Southern states represented in the Battle of Gettysburg to place a monument on the field. It is the only state monument built exclusively through the use of private contributions.1 On the face of the stone is an etching of three soldiers representing each of the Tennessee regiments in the battle. Three gray, marble stars are on top of the die symbolizing divisions of the state: eastern, central, and western Tennessee. The base is sixteen feet long as Tennessee as the sixteenth state to enter the Union. An additional feature is the outline of the state cut into the base. 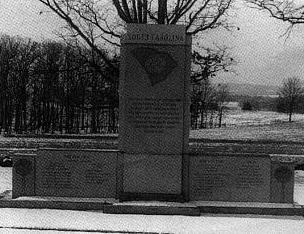 The units honored by the memorial were part of Archer's brigade of General Heth's division. The unit that opened the battle for the Confederates on July 1. The first Confederate casualty of the battle, Private Henry C. Rison was a member of Company B, 7th Tennessee Infantry. He suffered a gunshot wound that fractured his thigh while on skirmish duty early on July 1. On August 15, Private Rison died in a Union hospital . At 3 P.M. on July 3, the survivors of three Tennessee regiments would participate in the last infantry action of the battle as they advanced from the area near this site to assault the Union lines during "Pickett's Charge." It can therefore be said that Tennessee troops both opened and closed one of the great battles in history. 1 See Craven, Sculptures at Gettysburg, p. 85; Davis, Story Behind the Scenery , p. 36. CONTRACTOR: BASE - VAN AMRINGE GRANITE CO.
Florida was represented by three small regiments at the battle of Gettysburg and their services are honored and commemorated by the Florida State Memorial. 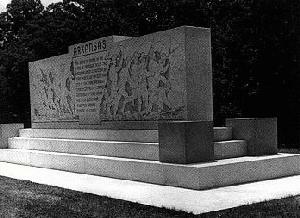 Located in the general area where Brigadier General Edward A. Perry's Florida brigade, under the temporary command of David Lang, was located during the battle, the monument consists of two granite plinths. The smaller plinth contains an inscription beneath three stars. These stars represent the 2nd, 5th, and 8th Florida Infantry Regiments. 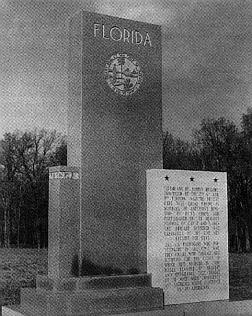 The sole decoration on the larger plinth is the seal of the state of Florida. 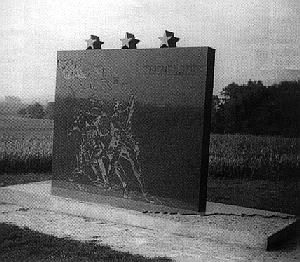 The memorial was dedicated on the one-hundredth anniversary of the battle, July 3, 1963. 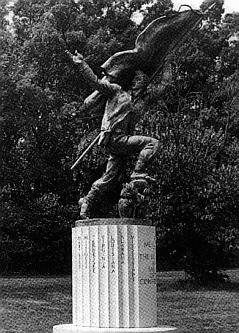 The third southern monument on the field attributed to sculptor Donald DeLue is the Mississippi Memorial, erected on the site where General William Barksdale's Mississippi brigade waited before going into battle the evening of July 2. Built to honor eleven infantry regiments, one infantry battalion, one cavalry regiment, and one artillery battery from Mississippi, the monument illustrates the bravery, devotion, and sacrifice of the Mississippi soldier in the face of great odds. 1. 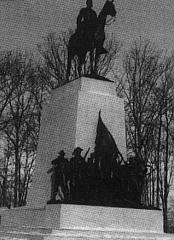 Craven, Sculptures at Gettysburg, p. 90. SHAFT: 3' SQ X 15' 6"
The South Carolina State Memorial at Gettysburg was erected in 1963 under the auspices of the state's Civil War Centennial Commission. Designed to honor the eleven state infantry regiments, two cavalry regiments, and the five artillery battalions, the monument was located where General J.B. Kershaw's South Carolina brigade formed up for the advance against the Union positions on July 2. Symbolically there are several features that clearly tie it to South Carolina, the most prominent feature being the sate outline and seal carved into the main shaft. On each side of the monument is a stone with a carved palmetto tree which underscores the nick name, of "Palmetto State". The side dies detail the names ands assignments of each South Carolina unit in the Army of Northern Virginia. At the bottom of the base is an excerpt from a song "Ode at Magnolia Cemetery" sung during ceremonies decorating graves of the Confederate dead on Confederate Memorial Day in April, 1867. "There is no holier spot of ground than where the defeated valor lies, by mourning beauty crowned." This was written by Henry Timrod, a native of Charleston. Active during the Civil War, and up until his death in 1867, Timrod wrote on Southern themes. His poems were so well known throughout the South that he received the title, "poet Laureate" of the Confederacy." The line was quite appropriate to this field and therefore was included on the monument. 1 Martin, Confederate Monuments, pp. 36. 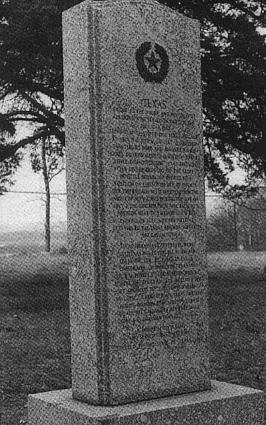 The decision to place a state sponsored monument here was tied to an appropriation to erect identical monuments on eleven battlefields where Texas troops had fought .2 Those at Antietam and the Wilderness, along with the ones at Gettysburg, specifically honor the old Texas brigade. Constructed of Texas Red Granite, the monument's only adornment is the lone star of Texas placed near the top. 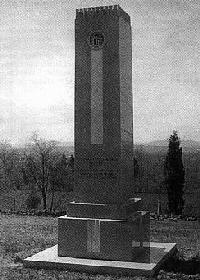 This simple monument appears plain when compared with the other southern state monuments, but the fact that identical monuments exist on other fields serve to assure that the sacrifice of Texas soldiers on one battlefield was not made to appear any greater or less on any specific field. 2 The eleven sites are: Antietam, Wilderness, Gettysburg, Bentonvile, Chicamauga, Fort Donelson, Kennesaw Mountain, Mansfield, Pea Ridge, Shiloh, Anthony, Texas. The only large scale monument specifically built to honor all Confederate soldiers was built at Vicksburg. Alabama was the third southern state to erect a memorial on the field at Gettysburg. 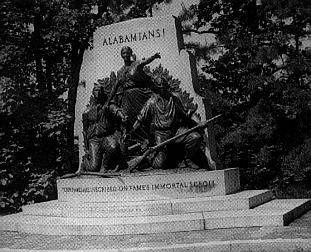 Inspired by the Alabama Division of the United daughters of the Confederacy, funds were approved out of state revenues in 1927. The memorial was designed to honor the gallantry and sacrifices of Alabama soldiers who served here. General Evander Law's Alabama brigade, positioned on the extreme right of the Army of Northern Virginia, was centered about where the monument now stands. 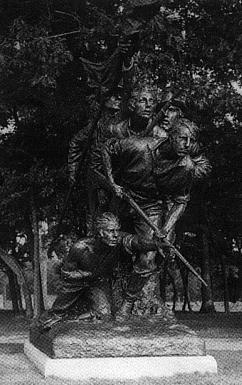 The central figure of the sculpture represents the spirit of Alabama.1 The two sculptures on either side symbolize the "Spirit" and the "Determination" of all Alabama soldiers.2 On the left the wounded figure is being comforted by the female figure at the same time she urges the other soldier on. To indicate the continuance of the struggle, an ammunition pouch is being passed on to the soldier continuing the fight. 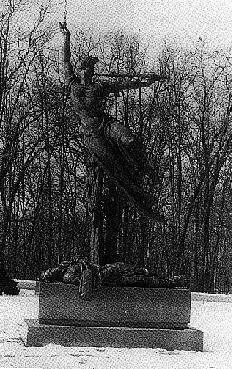 The monument was dedicated in Novembers, 1933, seventy years after the battle. 1. 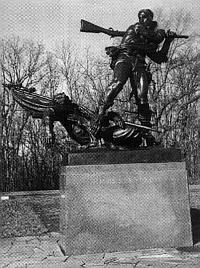 See Craven, Sculptures at Gettysburg, p. 94; A variation of this is that the figure represents the "Spirit of the Confederacy"; Gilbert, The Blue and Gray, p. 55. 2. Gilbert, The Blue and Gray, p. 55. As the Civil War centennial drew to a close in the 1960's, a movement was underway to erect a monument to honor the valor of all members of the Confederate armies and navies. It was decided that Gettysburg, as the greatest battle of that war and the symbolic "High Water Mark" of the Confederacy, would be the ideal location for such a monument. Contributions were received from three former border states, Missouri, Maryland, and Kentucky. Sculpted by Donald DeLue, the statue represents a charging southern color bearer, urging his comrades to follow him. The pink granite base contains the names of each of the states that contributed soldiers to the Confederate army. At the rear of the base is engraved the name of Walter Washington Wiliams who served as a forage master with a Texas regiment during the war. On December 19, 1959, at the age of one hundred and seventeen years, one month and five days, Williams died. The last member of the armed forces of the Confederate States of America had finally joined his comrades.1 1. There has been come controversy in the past over the validity of Walter Williams status as the "last" veteran. NPS officials currently doubt the claim, feeling that John B. Salling, a veteran of Company D of the 25th Virginia Infantry rightfully deserves the honor. Salling died March 16, 1959 at the age of one hundred and twelve years, ten months and one day.